With a high-power option and 10 calibrated wavelengths, the FPM-300 is the most complete, yet simple power meter available. 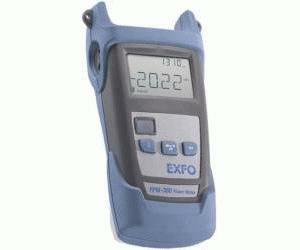 Combined with the FLS-300 or FOT-300 source units, which can transmit with a wavelength-identification digital encrypted protocol, the FPM-300 automatically uses the proper calibration parameters. This auto-wavelength recognition feature reduces the need for communication between the two technicians and decreases the potential for error. This product is part of the EXFO series of FTTx optical test products. It allows for the testing of passive optical networks (PONs) at the three main wavelengths (1310, 1490 and 1550 nm) used in fiber-to-the-home (FTTH) and fiber-to-the-premises (FTTP) networks and complies with the ITU-T G.983 and G.984 Recommendation series and the IEEE 802.3ah standard. Signal encrypting can also give the receiving end information on the power to be used as reference, helping ensure efficient referencing, even when the two units are far apart. Thanks to its unique design, the FPM-300 Power Meter reduces measurement time in typical measurement situations, as the need for an offset nulling is eliminated.